Want Your Dog to Come to You? Try Moving Away from Him.. 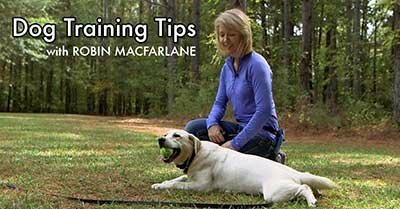 Communicating with your dog is about much more than talking to them. In fact, our words mean very little to our canine friends. Dog's have no concept of words and spoken language, at least not until we take the time to actually teach them associated meanings with individual words. While they can come to understand a considerable number of words over time (check out this blog about Chaser and her amazing abilities) = their primary means of communicating comes through body language. That is what I want to demonstrate to you today. I got a chance to meet Ally, a young lab pup. She was the perfect candidate to make a point about how effectively simple movements can communicate with our dogs. 1. Movement away from a dog will help encourage the dog to move toward you. 2. Movement toward a dog will help encourage movement away from you. Often times we're doing the reverse. We want the dog to come to us, so we keep moving toward them to try and "catch" them, and it rarely works! We want the dog to stop jumping on us, and we keep moving away from it, and it rarely works! Often our body language is communicating the exact opposite of what we actually want our dogs to do. It is not that a dog can't learn to overcome these conflicting cues, but we can certainly make the early learning easier if we get on the same page as their instinctual programing to begin with. Play with the concept, and see what you get. Happy Training! Next Article: "Catch me if you can!" Pull-Quote= Communicating with our dog is about way more than the words we choose.